BERN – Switzerland will not change its tack on tax information exchange agreements, and international pressure is unlikely to force the government to alter its view on the issue. The government of Switzerlnad does not see any immediate need to change the country’s current position regarding disclosing to overseas tax authorities the details of foreign individuals with accounts in Swiss banks, and the country will not enter into tax information exchange agreements with the EU in the near future, according to opinion of the President of Switzerland Ueli Murer as provided in an interview on April 14th. The President explained Switzerland’s position on information exchanges, saying that banking confidentiality should be viewed as seriously as medical confidentiality, and “…the state must absolutely respect the private sphere,” and should not be allowed to know “…what there is in your bank account”. 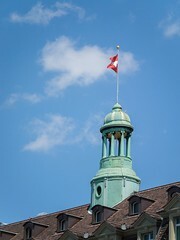 While Switzerland continues to resist current demands to implement tax information exchange agreements, the President conceded that it has already made some concessions for foreign governments, pointing to the country’s participation in the USA’s Foreign Account Tax Compliance Act, which requires international financial institutions to automatically provide data on all of their US clients to the US Internal Revenue Service. On the same day the minister of finance of Switzerland Eveline Widmer-Schlumpf also conducted several interviews, reconfirming the President’s position that in the foreseeable future Switzerland will not be entering into any agreements for the automatic exchange of information. She also noted that while Switzerland was facing immense international pressure to share more data with the EU, only internal pressure from within Switzerland itself could push the country towards changing its current standing.